You need to buy these jars. My drawer is super shallow, about 2.5” and these just fit. There are four per pack. Note that they do not come with shaker tops, so I use these little Indian masala spoons to get the spices out. They work great! To make the labels, I use this bluetooth printer that works with Android and iPhone apps. I use the labels with a border around them, I think it looks nice. I also chose all caps for a consistent look. The printer comes with one sample tape. I needed two packs to finish labeling all my spices (and then I started labeling other things - my files, my pantry items, the fuse box, etc.. what can I say, it’s addicting!). Here is the link to buy more labels. These ones are black ink on white tape but they have other color options available. 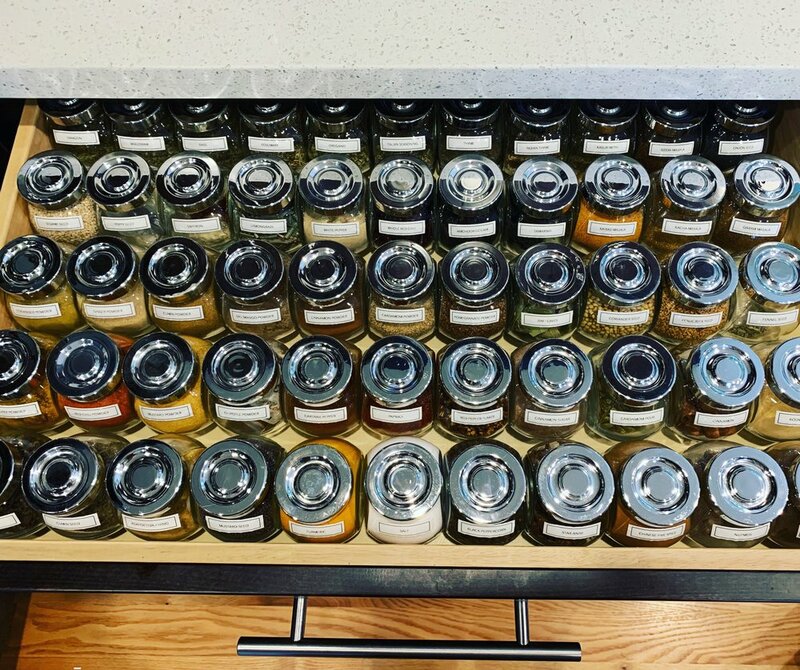 Hope you enjoy your new spice drawer as much as I do! Older PostWe had a baby!